The search for the truth is the most important work in the whole world, and the most dangerous. These men too were criminals. Their crime was vast. They had lost a war. And they had lived. 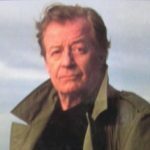 James Clavell was born in Sydney, Australia. He was an American novelist, screenwriter and film director. He is known best for his The Asian Saga series of novels and their televised adaptations. He wrote several novels include: King Rat, Tai-Pan, Shōgun, Noble House, Whirlwind, Gai-Jin, and Whirlwind. He dirceted several films include: Five Gates to Hell, Walk Like a Dragon, To Sir, with Love, The Sweet and the Bitter, Where's Jack?, and The Last Valley. He wrote several films include: The Fly, Watusi, Five Gates to Hell, Walk Like a Dragon, The Great Escape, 633 Squadron, The Satan Bug, To Sir, with Love, The Last Valley, and Tai-Pan.